Glyneisha Johnson. After Central St. 2018. Mixed Media. Simple question: do you feel safe? Artist Glyneisha Johnson’s collage, photographyand renderings, currently on display at the Union for Contemporary Arts, lead one to believe that question has relevant answers for the person who asks and shares her concern about the environment they live in daily. In her exhibit, “the black interior,” Johnson has created refuge in images that seek to create a safe space for Black people that do not limit them to stereotypical roles. In what seems to be an odd twist, she does this by embracing the absolute normalcy of her life, and the lives around her, whether that normalcy is obvious to on-lookers or not. To say that the work on display is merely well executed, which it is, is missing an enormous point, as it is also a history lesson for the initiated and uninitiated alike. What’s more, on a personal note, this exhibition is about nostalgia for something that exists to bring comfort. 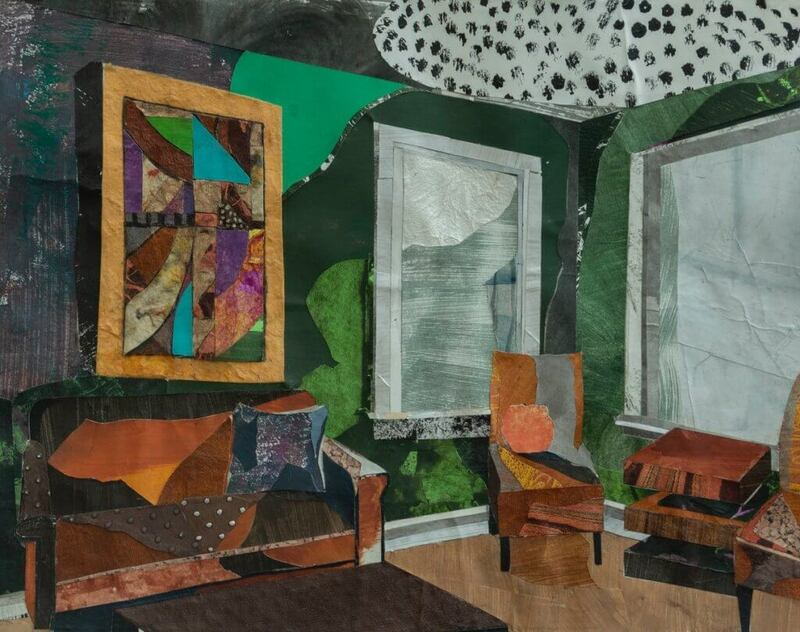 Not only does Johnson create this nostalgia and a sense of safety in her work, it seems she’s creating a collage of her life and memories, too. In Johnson’s piece “for us by us,”a large-scale pencil rendering, the scene is of a woman braiding another woman’s hair. The drawing is a little hazy, but overallthe clarity leads to a feeling of warmth-remember; this is a black and white pencil drawing, this isn’t easy to do. The work highlights the idea that the simplest setting, the obscurity of a place that brings comfort to those there, is something that at times isn’t easy to come by. Up closer to the work, you can see the sense of peace on the faces of people doing something people do all the time- but it’s the idea that someone cares, that somebody would help you with even simple things, that makes this piece stand out. 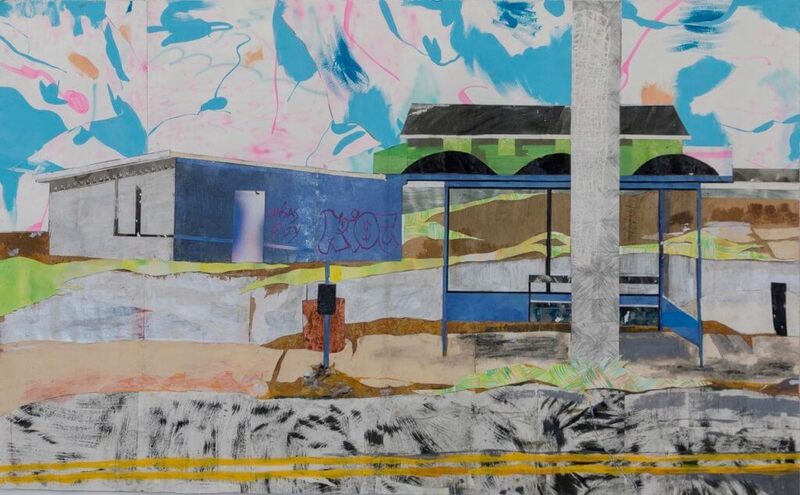 In her collage piece,”gettin ’familiar,”the scene is of buildings and a bus stop. The collage is created from discarded paintings from another artist. It was created from something thrown away, something someone didn’t want. The intimate way the materials are used, the idea of connection to something that was thrown away, and then re-purposed to make art, isn’t new, but is executed beautifully in this piece. Glyneisha Johnson. “Gettin’ Familiar,” 2018. Mixed Media. Johnson shows viewers a world that doesn’t exist in literal terms. Her imagery reveals simplicity of setting or character is typical. That doesn’t imply that the meanings of the work, the characters involved, or the techniques are simple. In each case, the works exemplify the complexity behind the perceptions of life as a Black person in America for all her viewer regardless of race. Black culture is co-opted by those that, at times, who would exploit or try to explain away that culture as being valuable in terms of money, but devoid of rich traditions or people that make significant contributions. Think of graffiti as one example; any and all techniques involved are complex and difficult to master with results as culturally significant as any public art. The overall perception of graffiti is often one of vandalism. The spontaneous moments at which some art is created, graffiti too, are exactly what make that art interesting, valuable and brilliant. It’s no easy task to make something that never was. Johnson excels at this. Though the number of works in the show isn’t many, the quality of execution and the revolutionary sensibility of the meanings of each piece are impressive. The intrinsic beauty of the message Johnson creates is also equally streaked with loss, pain and the struggle that life can be. The language of her works describes that limitless complexity. Remember that simple question: do you feel safe? Johnson is defiantly, probably for some, answering that question. The mere fact that she felt it necessary to create a safe space for Black people with her work, seems by itself to answer that question readily. The artist doesn’t take for granted the safety of Black people and points to places in history where they run the gamut of emotion and experience that other people have, but aren’t able to express themselves or interact in a common environment. Johnson finds her comfort zone in her art. The black Interiorreveals a world unique to her as well as to her culture, yet familiar to all willing to share it. Glyneisha Johnson, the black interior,runs until May 4, 2019 at the Union for Contemporary Art 2423 N 24thStreet, at the Wanda D. Ewing Gallery. The exhibition is open for viewing Tuesday 2-6 pm, Wednesday- Friday 12pm-6pm, and Saturday 10am-5pm. For additional information visit u-ca.org/exhibition.